ROUND CLAIMING THAT THEY KNOW STUFF WE DON’T KNOW. — Mrs. Wormwood in "Loud," the sassy and satirical putdown of learning . The Very, Very British Matilda The Musical Has Landed on Broadway With All the Its Very, Very British, Deliciously Scary Snap, Crackle and Pop In Place. 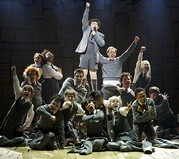 When Matilda The Musical became an Olivier Award winning hit in London the likelihood its crossing the pond and landing on Broadway was a no-brainer. After all, there's always room for a big show that's family friendly enough to sell more than the usual pair of tickets and have enough all ages appeal so that the adults don't feel that they're just along as chaperones. Fortunately, while Matilda is still playing in London, Bertie Carvel is on board as the sadistic head mistress, Miss Trunchbull. As Brian Bedford's Lady Bracknell made The Importance of Being Earnest worth seeing yet another time, so Carvel's bosomy, bully would be reason enough to see Matilda even if the rest of the show's assets weren't as dazzling here as they were over there. That goes for the four American kids alternating as the spunky super gifted little bookworm ( I saw Milly Shapiro but friends and colleagues have given high grades to all) to the rest of the American cast. Lauren Ward who, like Carvel, reprises her role as the supportive but also bullied teacher, was actually the only American in the London production so this is a welcome home coming as well as a reprise. Lizzie Loveridge's review of Matilda in London sums up what made, and still makes, it so refreshing and entertaining. For starters there's Dennis Kelly's faithful adaptation of Roald Dahl's dark but ultimately bracing 1988 children's novel about a super bright unloved little girl who thanks to a naughty streak and special telekinetic power gains happiness and self-esteem despite her abusive, tasteless parents and a school dominated by imagination crushing rules. Equally important vital is Rob Howell's inventive stage craft, Peter Darling's brilliantly peppy choreography and Tim Minchin's versatile, tuneful music. I'll therefore just add some additional comments to her review. It's re-posted right below the current production notes with a picture of Trunchbull and Miss Honey and also the lovely swing scene. I must however, preface my own praises with a word about the one aspect of this production that kept me from being as 100% bowled over as Lizzie was. Somebody —Director Matthew Warchus, voice director Andrew Wade, music director David Holcenberg, or someone — should be doing to adjust the auditory problems of the production and perhaps have the kids ease up on sounding British so that less of Tim Minchin's clever story propelling lyrics can actually be heard. The clarity problem often applies even the dialogue, especially the scenes when Matilda enthralls Mrs. Phelps (Karen Aldridg), the librarian with her continuing adventures in which her uncouth, unloving parents metamorphose into a loving couple she calls the Escapist and the Acrobat. 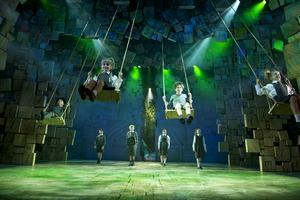 The way Matilda's story telling is illustrated and accompanied by music adds to the show's eye-popping pleasures. But this puts an enormous strain on the young actor's voice — and, alas, on the audience's ability to hear what she's saying. I should add that I spent most of the intermission, asking a number of youngsters and adults whether they were experiencing similar auditory issues. The adults all had problems understanding the words. The kids seemed either more attuned to this kind of amped up sound or got it all via the stage wizardry and from being Roald Dahl fans and consequently just thrilled to see these characters come to vivid musical life. That quibble, which is not a minor one, aside, this is indeed a thrilling musical. It's moved very comfortably into the Shubert theater with excellent use made of the aisles and, at one point, the front loges. The American taking over key roles couldn't be better. My Matilda, Milly Shapiro, has the stage presence of someone three times her age and she and her talented schoolmates execute the demanding dances with incredible skill and satisfyingly capture the revolutionary spirit that finally undoes the monstrous Trunchbull. Karen Aldridge is warm and appealing as the librarian who, besides Miss Honey her teacher, is the only other supportive adult in Matilda's life. Like Bertie Carvel, Lesli Margherita and Gabriel Ebert as the unloving vulgarian parents make these meanies fun to watch. The ditzy, dance competition obsessed Mrs. Wormwood is terrific in "Loud" which is a snazzy the satirical rant against educated pursuits. Ebert as her sleazy used car salesman spouse will be a revelation to anyone who saw him in Amy Herzog's non-musical 4000 Miles. Who knew he was such a nimble song and dance man. With his green hair (courtesy of Matildá's being naughty to make up for her mistreatment) and garish green plaïd suit to match. In "Telly" he too proudly proclaims his disregard for book learning with “All I know I learnt from telly.” The actor not only makes Daddy Wormwood a funny but complex character but delivers an amusing tongue-in-cheek audience address vaudeville bit at the end of the intermission (best to rush back from the bathroom if you don't want to miss it). I've already praised the Peter Darling who also choreographed Billy Elliot but there's no overpraising his contribution to the success of Matilda. This is especially true for the ensemble numbers like the discipline advocating “Smell of Rebellion” in which Trunchbull puts the ensemble through an exhausting routine that includes vault tumbles. We had heard from its showing in Stratford Upon Avon last year that Matilda the Musical was rather special but I didn’t expect to be so blown away by this delightful production about the precocious little girl who loves books and is born into a family of book hating telly addicts. 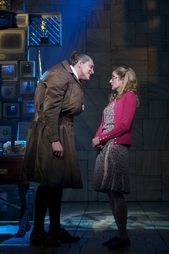 Delightful as ten year old Eleanor Worthington Cox is as Matilda, it is Bertie Carvel as the wicked headmistress Miss Trunchbull who stole the show for me. It all goes wrong for Matilda at birth when her father, the second hand car dealer Mr Wormwood (Paul Kaye), refuses to acknowledge that she is a girl and calls her boy throughout. Her mother (Josie Walker) is obsessed with ballroom dancing competitions with her dance partner the slimy Rudolpho (Gary Watson). The music will have you trying to work out where you have heard those notes before, so I presume what we have here is not derivative but pastiche. The tunes are a play on the style and rhythms of those from Oliver, Phantom, Les Miserables and many other well known musicals, and even grand opera. They make excellent hearing. Minchin’s lyrics too are great fun. The choreographed children have been drilled to within an inch of their life and the set piece numbers are startingly good. “When I Grow Up” in which we see smaller children grow up and switch swings with their older counterparts is really impressive and memorable. I loved the gym drill over the gym horse which culminates in Trunchbull athletically skipping with a gymnastic ribbon. Matthew Warchus’ production has plenty of dark fun in it to satisfy adults in the audience but the heart warming story of the delicate Miss Honey never feels sentimental or schmaltzy as admirably underplayed by Mrs Warchus, Lauren Ward. I saw 10 year old Eleanor Worthington Cox as Matilda. She is one of four alternate Matildas. She sings and dances superbly but is a natural actress with an innocent charm that pleases. Bertie Carvel gives a superbly, wry comic performance as Miss Trunchbull. Part leather clad Richard III, part daunting Olympian in the strength field events, she has a capacious bosom adorned with a T shirt of Olympic rings. Trunchbull so should have been the symbol of the London Olympics in 2012! Carvel has a large hairy mole on his face and stands giving the audience amused asides with one hand permanently bent backwards. We cheer on Bruce (Jake Bailey) who has the challenge of eating all of Miss Trunchbull’s Chocolate Cake and love the rock number at the end when the children sing “Revolting Children”. Rob Howell’s set and costume designs are delightful. Library shelves fill the stage and the surround is alphabet building blocks lit dramatically by Hugh Vanstone. The RSC may have as big a hit with Matilda as they did with Les Miserables back in 1985. And what do I want for Christmas? A ticket to see Matilda again! With: Peter Howe, Melanie La Barrie, Matthew Malthouse, Emily Shaw, Verity Bentham, Alistair Parker, Marc Antolin, Nick Searle, Lucy Thatcher, Matthew Clark, Michael Kent, Rachel Moran, Leanne Pinder.